Come experience the outdoor Gulf Coast lifestyle in a vacation home at Kiva Dunes Golf and Beach Resort in Gulf Shores Alabama; the championship golf course was designed by former U.S. Open Champion Jerry Pate and has consistently been voted one of America’s best since it opened. 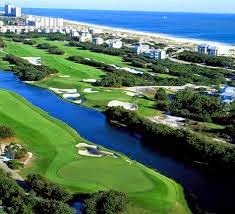 The course sits along the beautiful Gulf of Mexico and has numerous residences on the Southern side of the course as well as the East and West ends of the golf course. Kiva Dunes is located approximately 15 minutes west of downtown Gulf Shores on the Fort Morgan Peninsula, near marinas and the Beach Club Resort which has nice restaurants and tennis facilities; also close-by are Historic Fort Morgan and the Bon Secour Wildlife Refuge. Beach and golf-course houses in Kiva Dunes are a short walk to the sandy shores and convenient to all the shopping, dining and entertainment available in Gulf Shores.